Written by one of the foremost and widely-respected writers in the field, this volume sheds new light on the forms and premises of the communicative experience. In doing so, it challenges the theoretical positions of marxist and "political economy of media" analysts who focus largely on the structure of economic and social power within the media. Instead, Scannell explores the structuring of engagement of the viewer/listener with the broadcaster by analysing the communicative intentions of the broadcaster and the understanding by the audience of those intentions. This powerful and accessible book makes an important contribution to media studies in showing students how the history of the media can be enriched by communications theory. Paddy Scannell is one of the founding editors of the journal Media, Culture and Society. His publications include A Social History of Broadcasting, co-written by David Cardiff (Blackwell, 1991). He is a reader at the Center for Communication and Information Studies at the University of Westminster. 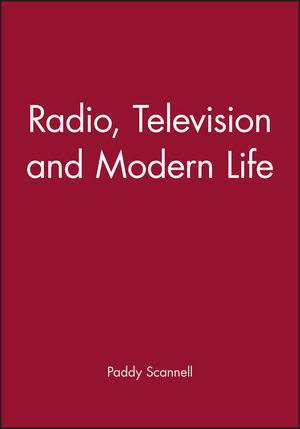 * This text -- through its use of case studies and thematised treatment -- offers a more imaginative approach to the study of the historical development of broadcasting than any other available source. * An introductory chapter helps orient the reader and provides a helpful framework in the form of a literature survey and overview of arguments about broadcasting. This helps to place Paddy Scannell's approach and perspective against that of other writers. * This book fills a gap in the market. There are currently few, if any good books, which bring together material on radio and television.